The latest War Story on console puts tankers in the driver’s seat of a three-part storyline to infiltrate a “Tiger” production facility located in North Africa and steal a prototype to change the course of events during the Battle of El Alamein. The newest War Stories campaign Runaway Tiger available now for World of Tanks on PlayStation 4 Pro, PlayStation 4, Xbox One X, Xbox One S, Xbox One and Xbox 360. Runaway Tiger is an alternate history campaign where the Allies have secretly gained access to a German production facility and are aiming to escape with the German’s heavily guarded secret– a prototype of the Tiger (Panzer VI) tank. Under the cover of a heavy sandstorm, French resistance fighter Marianne Durieux has been commissioned with the impossible: to capture the well-guarded Tiger tank and break out of the facility. With the German forces on high alert, tankers will encounter waves of challenges and face off against Tiger prototypes whilst attempting to escape the facility. Making it to the city of El Alamein will secure the Tiger prototype and, subsequently, a legendary victory for the Allies. Runaway Tiger also includes new music composed by legendary gaming composer Inon Zur (Fallout 3, Fallout 4, Dragon Age: Origins, Dragon Age 2, Crysis). Inon’s former armed service in a tank platoon helps him to create the perfect score for World of Tanks, further immersing tankers in the story-driven experience. The fifth campaign is available on all Consoles free of charge. 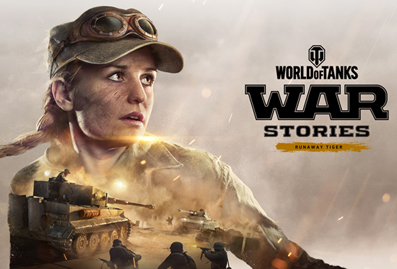 Altogether, War Stories deliver more than a dozen hours of single-player and coop content for World of Tanks. PlayStation 4 Pro and Xbox One X owners can witness the Marianne Durieux’s assignment in 4K resolution and with spectacular HDR support.